As I bit into my Southern Fried Chicken wrap from Boots during lunch today (hey, hey, hey ... don't judge, don't judge! I dreamed about fried chicken a couple of nights ago ... a big, KFC bucket of fried chicken wings ... so close, yet so far away ...), I noticed that they had changed a few things (not that I've had it more than once - but even if I did, you shouldn't judge me). First, the packaging was so much more convenient and hygienic: now you can eat the wrap without virtually touching it! Genius! Welcome to the 21st-century, Boots. Secondly, they've replaced the unhealthy onions, lettuce and mayo combo (mmm ... my favorite, not my co-workers' though, as I breathe my onion-breath-of-fire upon them in the afternoon) and substituted it with a similarly unhealthy concoction of coleslaw, salsa and ... sweetcorn. I have one thing to say to that: WHY? Why do Brits insist on ruining perfectly good food items with the persistent inclusion of sweetcorn? WHY? Take canned chicken noodle soup, for example (again, not that I eat that stuff, but you know, if I did ... don't judge me). Once, in my flu-addled state, I stumbled to the nearest Tesco, grabbed a can of chicken noodle soup from the shelf and shuffled, zombie-like, into the line to pay. Only after I had subjected myself to that second level of hell, did I realize, upon opening the said can of soup into a pot, that it had slices of red bell pepper and ... worst of all ... SWEETCORN. At the sight of that, I burst into tears. Tuna and sweetcorn is another popular combination. Okay, I mean, I get where you're coming from - tuna tastes good with a bit of crunch, which is why most people pair it with cucumber. Or even celery. Lettuce! 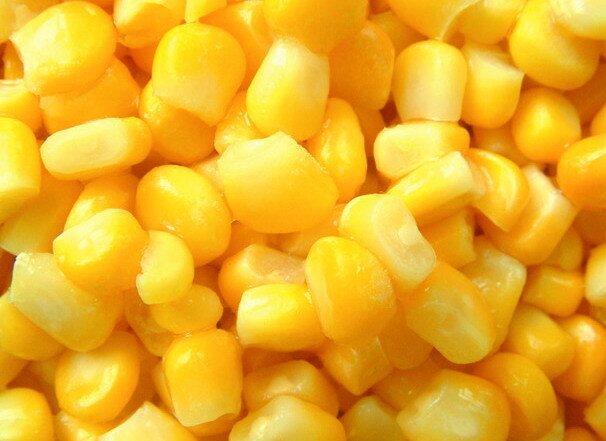 Why sweetcorn? Then there's sweetcorn on pizza. I mean, seriously. Need I say more? Didn't think so. And if you walk up Kilburn High Road on your way to find the nearest KFC, there's a cart selling something called "Magic Corn". Yes, that's right, Magic Corn. It comes in flavors like "magic curry" and "magic cheese." Look, I know what you're thinking. But I honestly couldn't make it up if I tried. I'm surprised y'all don't have sweetcorn ice cream. what's with the hate on sweetcorn... i mean ok so the brit concoctions i'm not feelin' but in general i happen to like sweetcorn. you know like black bean and corn salad and the like. Look, I have nothing against sweetcorn. But what I do have something against is when people put defile perfectly delicious things like PIZZAS and CHICKEN NOODLE SOUP by adding sweetcorn. That's what I have a problem with.